Newly Discovered Medieval ‘Silian 3’ Stone On Display! On Friday 7 June, Royal Commission staff member, Nikki Vousden, invited members of the public to St Sulien’s Church to see the newly-discovered medieval carved stone, ‘Silian 3’. 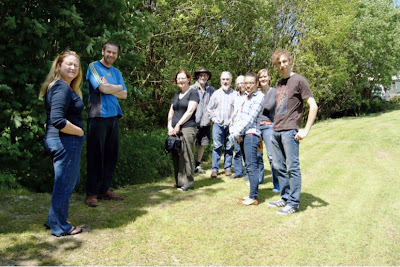 Professor Nancy Edwards, of Bangor University, and archaeologists from Lampeter University also attended. Nancy Edwards, specialist in medieval stone sculpture and author of A Corpus of Early Medieval Inscribed Stones and Stone Sculpture in Wales, noted the lost stone in Volume II of her corpus and was keen to see it for the first time. She used a torch to highlight the decoration, and carefully examined the stone to check that there were no further signs of carving. Professor Edwards noted that although the cross and lozenge pattern appears on at least three other carved stones in Wales, she does not know of another example of the pattern as a whole. She also noted that the carving consists of punch marks, meaning that the pattern was punched out using a metal tool. Professor Edwards was of the opinion that part of the original pattern has broken off, although its outer edge is evident in places. Professor Edwards takes notes while a torch is used to highlight detail of the stone’s decoration. 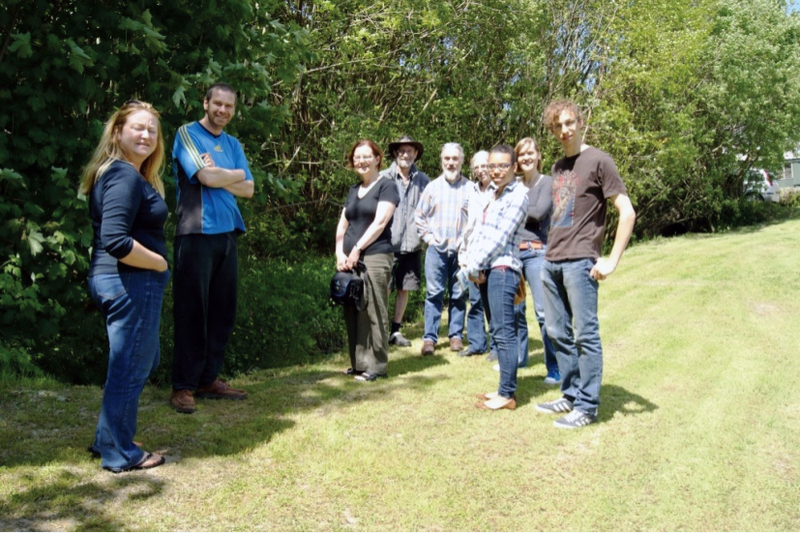 Around 30 locals and visitors to the area attended the event, as did Reverend Chris Webb (Silian’s vicar) and archaeologists from University of Wales TSD Lampeter, including Professor David Austin. In addition to listening to the expert opinion of Professor Edwards, visitors also had the opportunity to view the find-spot. Professor Edwards took a photograph and GPS reading of the location, in order to update her records. The location of ‘Silian 3’ is no longer unknown, as stated in her corpus! 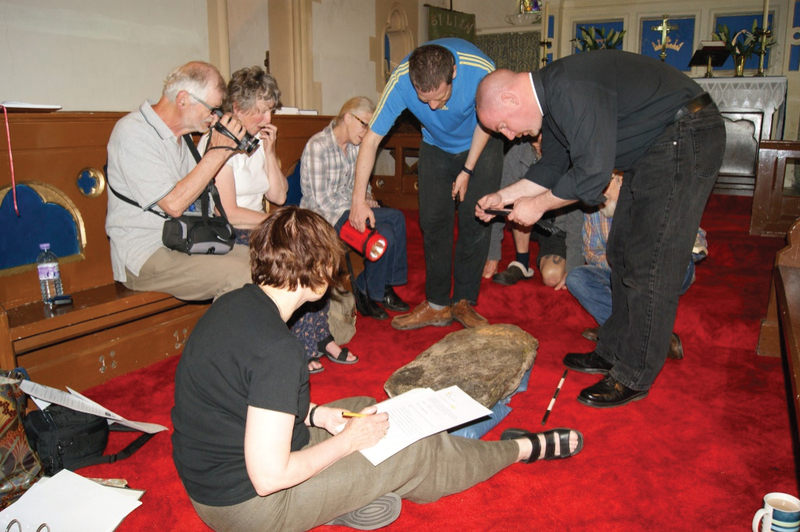 Archaeologists, Professor Edwards and locals pay a visit to the find-spot. Article by Nikki Vousden, Data and Technology Team. Please comment and let us know your views or your news. Remember that what you write can be read by everyone. RCAHMW reserves the right not to publish offensive or inaccurate material. Our Friends Network allows people interested in our work to show their support, keep in touch with what we are doing, and help us improve our services. New information on the ‘Silian 3’ stone! 'Finest Elizabethan town house in Britain’ on the market - It has today (01 April 2019) been revealed that Plas Mawr, an Elizabethan town house in Conwy, is up for sale — after more than 25 years in the care of Cadw. The Royal Commission on the Ancient and Historical Monuments of Wales uses this blog to let you know about its work in archaeological and architectural survey and investigation, its user-services, web-services and its publications. We are interested to hear your views about the archaeology and architecture of Wales, Welsh heritage and the work of the Commission. Visualization showing the construction of Pontcysyllte Aqueduct. Produced by See3D Ltd. on behalf of The Royal Commission on the Ancient and Historical Monuments of Wales.